Actinomyces are anaerobic, Gram-positive, nonacid-fast, branched, filamentous bacteria which are known to colonize as commensals in gingival crypts, dental calculi, and tonsillar crypts in oral cavity., The percentage of tonsillectomy specimens with colonization of tonsillar crypts by Actinomyces varies from 6.7%–35% as seen in various studies.,, Actinomycosis is not an opportunistic infection and usually occurs in healthy individuals. 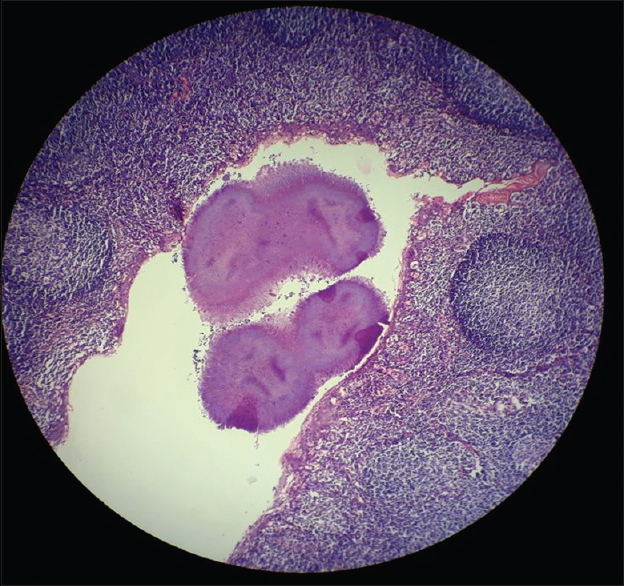 The characteristic finding on histological examination of the tissue is an outer zone of granulation tissue and a central zone of necrosis containing many sulfur granules that represent microcolonies of actinomyces. Actinomycosis infections of the head and neck, although fairly uncommon, represents an important entity because of its varied presentation that may mimic other common diseases, the difficulties involved in its diagnosis, and the long course of treatment mandatory to eradicate the disease. 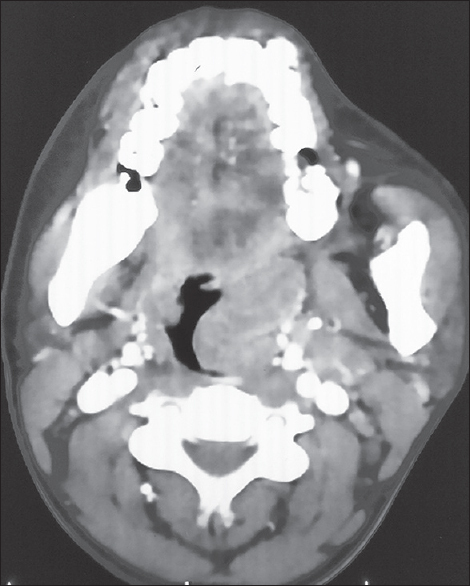 A 20-year-old female, a known case of fibrous dysplasia involving the frontal bone, maxilla, and mandible on the left side, presented to the outpatient department with complaints of chronically progressive pain and difficulty on swallowing for 1 year. The patient gave no history of change in voice, difficulty in breathing, snoring, mouth breathing, or painful neck swelling. She had been prescribed several courses of antibiotics and analgesics by various local general practitioners over the course of this 1-year period. On general examination, the patient had dysmorphic facies, but the rest of the examination was essentially unremarkable. Examination of the throat revealed a Grade IV enlargement of the left tonsil which had an irregular surface with multiple whitish excrescences on the surface. There was Grade II enlargement of the right tonsil. Videolaryngoscopy confirmed the clinical findings. In view of the unusual clinical appearance of the mass, the patient underwent contrast-enhanced computed tomography of the neck, which showed a well-defined heterogeneous mass lesion with irregular borders in the oropharynx arising from the left tonsillar fossa measuring 3 cm × 3.1 cm × 3.5 cm [Figure 1]. Fine-needle aspiration was reported as nonspecific. Subsequently, the patient was taken up for tonsillectomy under general anesthesia, and the specimen [Figure 2] was sent for histopathological examination which revealed tonsillar crypts lined by squamous epithelium with underlying subepithelium composed of lymphoid follicles with prominent germinal centers. Focal areas in the crypts showed actinomycotic colonies with Splendore–Hoeppli phenomenon with areas of central necrosis [Figure 3]. Postoperatively, the patient was managed with a course of intravenous (IV) penicillin for 2 weeks followed by 6 months of oral penicillin. The patient was asymptomatic at 1-year follow-up and examination did not reveal any recurrences in the tonsillar fossa. Von Langenbeck was the first to report actinomycotic infection of humans in 1845, and he attributed the cause to be a fungus, a view that was reflected by Harz in 1877 when he named the infecting organism as Actinomyces, which means ray fungus. Israel and Ponfick delineated the anaerobic nature of actinomyces and isolated it from humans in 1891. Five species have been identified: Actinomyces israelli, Actinomyces bovis, Actinomyces naeslundii, Actinomyces viscosus, and Actinomyces odontolyticus. Except for A. bovis, all the species are normal inhabitants of the human oral cavity. Actinomyces is a Gram-positive, anaerobic, or microaerophilic bacterium that grows as a hyphae or filamentous organism. Precipitating factors for the infection include dental caries, dental manipulations, and maxillofacial trauma. The pathogenesis of the organism is ascribed to its ability to act as an intracellular parasite and thus resist phagocytosis, as well as its tendency to spread without respect for established tissue plains or anatomic barriers. Cope, in 1938, classified actinomycosis infection into three distinct forms: cervicofacial (50%), pulmonothoracic (30%), and abdominopelvic (20%). Definitive diagnosis may be established only by positive culture; however, actinomycosis growth is very difficult even on appropriate anaerobic media, and so, microbiological identification of this organism is often impossible. Incisional biopsy can assist to a large extent the diagnosis of actinomycosis. The typical findings include the presence of sulfur granules seen as basophilic masses with a granular center and a radiating fringe of club-shaped protrusions as well as the distinctive filamentous and beaded actinomyces. Computed tomography and magnetic resonance imaging usually yield nonspecific findings, contributing only to define radiological features of the mass and its involvement in adjacent soft tissues. On account of this, the clinical differential diagnosis of actinomycosis is usually quite difficult. The current recommended medical therapy includes 4 weeks of high-dose IV penicillin followed by a 3- to 6-month course of oral penicillin, continuing treatment even after total resolution of symptoms. Other antimicrobials that have been found to be effective include tetracycline, erythromycin, and clindamycin. These can be used in penicillin-allergic patients with good success rates. Ciprofloxacin has been used for treatment of recalcitrant cases. Hyperbaric oxygen has also been used in one report as adjuvant treatment because of its direct bactericidal effect. 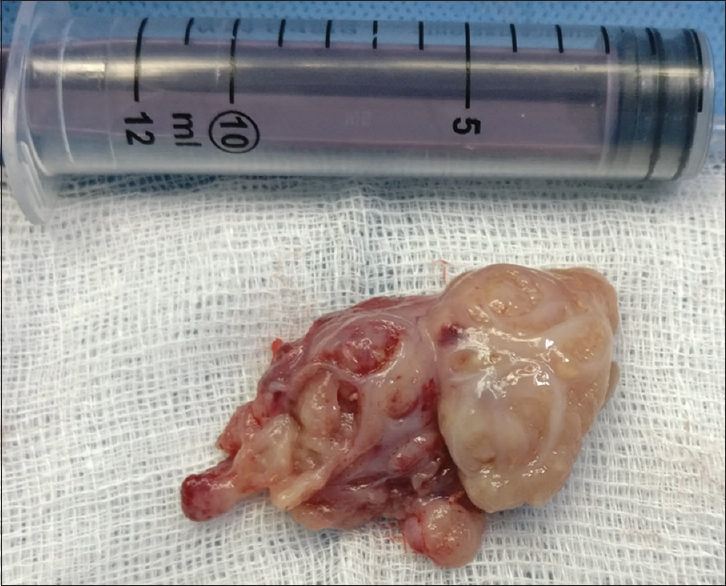 Classical surgical excision is thought as a definitive treatment for head-and-neck actinomycosis, and tonsillectomy is usually curative for tonsillar actinomycosis. There are no specific measures for preventing actinomycosis; however, maintenance of good personal orodental hygiene, and in particular, removal of dental plaque, may reduce the density if not the incidence of colonization and low-grade periodontal infection with Actinomyces species. Actinomycosis of the head-and-neck region is an important entity because it can masquerade any oropharyngeal malignancies or can mimic any other common lesions in oropharynx. Lesions in the head-and-neck region that do not respond to common antibiotic therapy may arouse suspicion of actinomycosis. In tonsillar actinomycosis, tonsillectomy is the treatment of choice and histopathological examination of the resected tissue is the diagnostic modality of choice. This case highlights the need to consider actinomycosis in the differential diagnosis of unilateral tonsillar hypertrophy. Soler Sendra A, Subirana Pozo FX, Consola Maroto B, Serra Carreras J, Cuquet Pedragosa J. Tonsillar actinomycosis manifested as expectorated debris. Acta Otorrinolaringol Esp 2009;60:372-4. Assimakopoulos D, Vafiadis M, Askitis P, Sivridis E, Skevas A. The incidence of Actinomyces israeli colonization in tonsillar tissue. A histopathological study. Rev Stomatol Chir Maxillofac 1992;93:122-6. Mohamad I. Actinomyces in the tonsils: Hospital Universiti S ains Malaysia experience. Internet J Otorhinolaryngol 2009;8:1-4. Gaffney R, Harrison M, Walsh M, Sweeney E, Cafferkey M. The incidence and role of actinomyces in recurrent acute tonsillitis. Clin Otolaryngol Allied Sci 1993;18:268-71. Mohanty S. Actinomycosis of faucial tonsil masquerading as oropharyngeal malignancy. Indian J Otolaryngol Head Neck Surg 2006;58:82-4. Rippon JW. Medical Mycology. Philadelphia: W.B. Saunders; 1974. p. 13-28. Schwartz HC, Wilson MC. Cervicofacial actinomycosis following orthognathic surgery: Report of 2 cases. J Oral Maxillofac Surg 2001;59:447-9. Nagler R, Peled M, Laufer D. Cervicofacial actinomycosis: A diagnostic challenge. Oral Surg Oral Med Oral Pathol Oral Radiol Endod 1997;83:652-6. Aydin A, Erkiliç S, Bayazit YA, Koçer NE, Ozer E, Kanlikama M, et al. Relation between actinomycosis and histopathological and clinical features of the palatine tonsils: A comparative study between adult and pediatric patients. Rev Laryngol Otol Rhinol (Bord) 2005;126:95-8. Smego RA Jr., Foglia G. Actinomycosis. Clin Infect Dis 1998;26:1255-61.